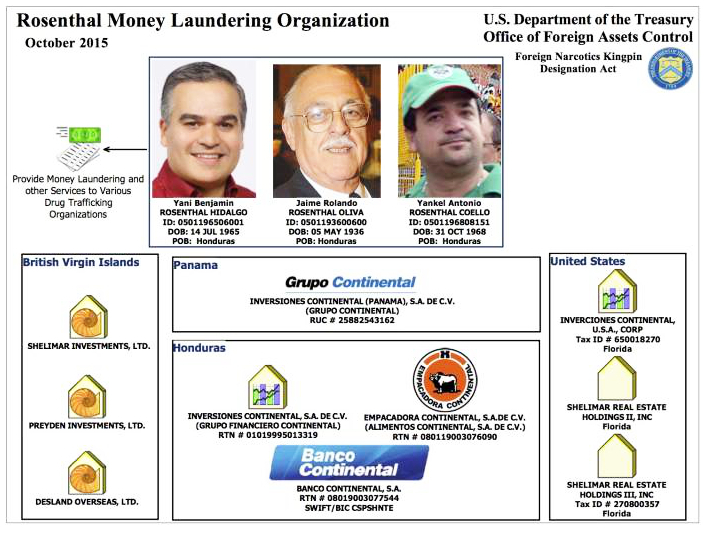 The alleged Honduran money laundering kingpins, who are accused of running their corporate HQ out of Panama. US Department of Treasury graphic. The US government, with President Obama and former Secretary of State Clinton saying one thing while doing another and the Republicans baiting them for not being militant enough about it, supported a coup against an elected Honduran president. Since then death squads have stalked that country, in particular silencing critical journalists and in general sending many people fleeing the country for their lives, including children who without adults accompanying them have slipped across the US border. There have been “elections” held under that thuggish regime, duly certified by Washington as “free.” The US-sponsored Honduran regime has been a staunch ally in the “War on Drugs,” allowing the country to be turned into a DEA free fire zone in which soldiers in helicopters shoot people in little boats first and suppress all reasonable questions later. And until June, as Minister of Investment in that death squad regime, there was Yankel Rosenthal, one of the suspects shown above. He’s now in jail in the USA, charged with being one of the world’s principal drug kingpins. The alleged corporate money laundering mill is said to have been run out of Panama City’s banking district. The Rosenthals’ Panamanian business structures were set up by the same rabiblanco law firm that set up another Panamanian company run by another well connected family in Honduras. That’s the Khafie family and their company is GENISA, of Barro Blanco Dam infamy. One of GENISA’s directors is behind bars in Honduras on allegations of a huge theft from the Honduran public health care system. So now Washington takes a stand for the rule of law. Why should anyone believe that US politicians have anything useful to tell Latin America? Why should Panama be a participant in the US drug wars? Why should Panamanians, or Hondurans, show any deference at all to the families with the illustrious surnames? Debates, like wars, are properly judged on the basis of their political effects. It’s not like a contest between university debate teams in which points are added or subtracted, any more than a war is determined by body counts. In the US Civil War the Union side took considerably more casualties than their Confederate foes, yet decisively crushed the Old South and its social and economic structures. It will take a few days and some scientific random polling to get a better idea of who won and who lost the October 13 Democratic presidential candidates’ debate. At first glance, although there were some points scored for and against each candidate, the showdown in Las Vegas saw no huge gaffes and confirmed that the contest is essentially a two-candidate race between Hillary Clinton and Bernie Sanders. Unless events intervene, there seems to be no opening for Joe Biden to step into the race with much hope of success. Martin O’Malley, Lincoln Chafee and Jim Webb were all confirmed as serious men with some interesting things to say, but non-contenders at this point. Democratic National Committee chair Debbie Wasserman Schultz probably succeeded in reducing the audience for the debate. It seems that the audience was skewed a bit toward fervent Sanders supporters, while Wasserman Schultz is trying to rig the race into a Hillary Clinton coronation. Would a low-turnout primary and caucus season populated by Bernie’s enthusiastic legions work to Hillary’s advantage? That’s a dubious calculation. The whole exercise is driving many Democrats to ignore those increasingly shrill DNC fundraising emails. Anderson Cooper was an insufferable moderator, both for trying to dumb down the debate into a food fight over contrived Republican narratives about Benghazi and Hillary’s email server and for his shallow ideological baiting of Bernie’s democratic socialism and skepticism about the dominant forms of capitalism currently practiced. On the latter score, count him as a corporate representative for a business that stands to lose billions in ad revenue if unlimited campaign spending is curbed. On the issues the candidates voiced different views on inequality, war versus peace issues and guns, with Bernie having shifted his opinions a bit about the last of these and Hillary about the first, but a lot of details to be debated in future encounters. Hillary is a hawk, something of a neoconservative lite who does not acknowledge the connections between interventions in Iraq, Libya and Syria and the nightmarish consequences that followed. None of the other candidates are that reckless, but it may be that given the situations that have arisen there isn’t a great deal of difference among the candidates about what they would do now in those specific instances. Mrs. Clinton’s special animosity toward the Iranians and the Russians, however, doesn’t leave her in a very good position to confront the Islamic State in a way that’s coordinated with others who live in the same neighborhood with that brand of Sunni fanatics. When Bernie jumped in to dismiss the fuss over Hillary’s emails as a tiresome and scarcely relevant distraction, some pundits figured that he blew it by conceding a potential avenue of attack that he could have used aganist his opponent. Let us see whether Democratic primary voters consider petty and vicious to be “strong,” as opposed to being fair and honest as “weak.” It seems that as part of the degradation of public discourse in the United States a strain of media personalities has become so blinded by its own “gotcha” style of reporting and commentary as to lose the sense of proportion. So who won? Soon enough some good polling will suggest how this round should be scored. But there is a long campaign for the nomination ahead and nobody is yet a certain winner. This country has socialism for the rich, rugged individualism for the poor. There are also as many Eastern European immigrants coming who have relationships to a German grandfather, uncle, or whatever, and of course that gives them the right to German citizenship because of this strange law which says that only by blood are you German. It’s an antique, and one of the most repressive laws I can think of, dating back to the Hitler days. So the people who can prove any German descent whatever suddenly are German, while a foreign worker who might have lived thirty years in Germany with his family, has paid taxes, contributing to society, may not get German citizenship. Yet, a person coming from Poland can become German overnight. The situation is rather ridiculous.